Yes, before there was the internet, there were cats. According to website Cool Hunting, an upcoming exhibition of cat woodblock prints is coming to New York's Japan Society Gallery. 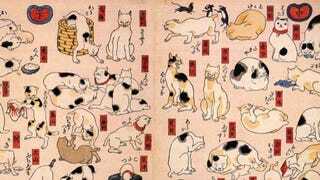 During the Edo Period, cats were a popular subject matter for Japanese artists. Cats are cute, sure. In Japanese folklore, the animals can bring good luck. But they can also bring harm, with legends that split-tailed cats called neko-mata could stand up and walk, converse with humans, kill humans, and even raise and control the dead! Felines also appeared in 19th century woodblock prints and drawings to parody human behavior, as gags, or, like today, simply to be cute. Then, there are images of cats that are just that: cats. Here's a selection of Japanese cat prints and drawings, many of which, no doubt, will appear at the upcoming Japan Society exhibit. In this Utagawa Kuniyoshi print that dates from the early 1840s, cats are used to spell out the Japanese word for "catfish." Yes, cat font is that old. The above Kuniyoshi image is from a kabuki play in which a cat takes the form of a woman. Nice Edo Period nekomimi! This is a "cat dance." The fish on their fans is a nice touch. These artists would've loved the internet. "Life of Cats: Selections from the Hiraki Ukiyo-e Collection" opens on Friday.